If you’re looking for a group of skilled technicians to service your pool or you are considering someone to completely remodel your backyard, Crystal Blue Pools and Patios can assist you in all of these.We have been in business in the desert since 2005. Fully licensed fully insured. Crystal Blue Pools and Patios provides residential pool service and anything pertaining to backyards such as patio covers, misters, fire pits, concrete paving and more in the desert. We are your one stop shop for anything having to do with backyard entertainment. To create your dream backyard or to enhance and maintain your outdoors call Crystal Blue Pools and Patios Today! We offer a wide variety of affordable, quality pool services to all Coachella Valley. Weekly and bi-weekly maintenance programs, cleaning, chemical services and acid washes all done at your convenience by our certified pool technicians. Crystal Blue will help maintain your pool, creating a healthy environment for your family and friends. 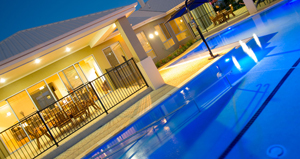 Crystal Blue offers a wide range of pool repair services including equipment repairs, plumbing repairs, pool draining services, pool tiling and more. 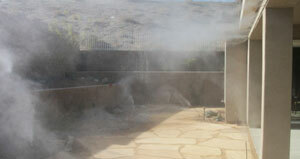 We also service all major brands of automatic pool cleaners including Hayward, Polaris, Pentair and Zodiac. Give us a call today for affordable pool repair services. 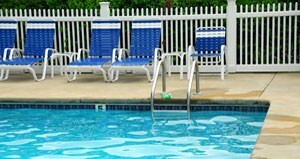 Weather if you are planing to renovate your existing pool or to add a new one, Crystal Blue can help. We can design and build your dream pool within your budget. Please take a moment to visit our pool design gallery and schedule a complimentary in-home design consultation today. Now you can enjoy the look, beauty, and protection of a real wood patio cover without the cost or maintenance of wood. Alumawood patio covers by Amerimax are attractive, affordable and durable. 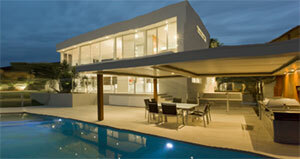 Enjoy your outdoor living space while improving the value of your home, garden and lifestyle. 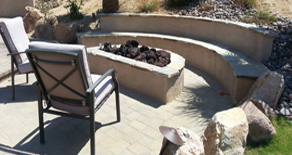 Custom fire pits are a very popular backyard attraction here in the desert. We can design anything from a simple circular or square pit to a fancy water feature that incorporates the fire into the design. Planing a BBQ Island as the centerpiece of your backyard? Give us a call for free in-home consultation. Appreciate your patio all day! Even on the warmest summer day, a mister can drop the outdoor temperature by up to 25 degrees F, allowing you to enjoy your backyard even during the scorching late afternoon hours. Here’s to a relaxed and cool summer with some planning you can better enjoy your patio. 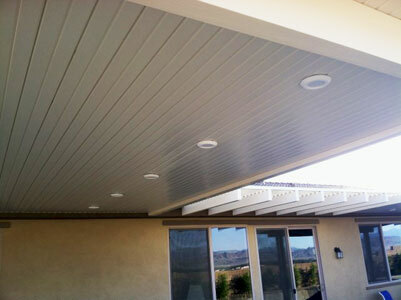 We proudly install Amerimax Alumawood Patio Covers in Coachella Valley. 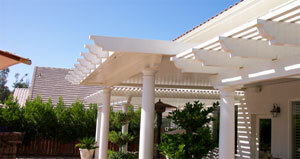 Amerimax offers the most complete and exclusive line of shade structures in the industry. Every design detail has been carefully considered to enhance the aesthetic and functional appeal. Each component is manufactured from structural grade materials and finished with a high performance coating system offered in a variety of colors.